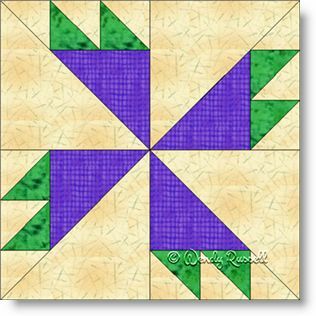 The Rosebud quilt block is a four patch which also makes good use of the half square triangle unit. The quilt you make using this block would look spectacular if you chose to use up your scraps. The resultant quilt would give the idea of a garden, since you would have a variety of "roses" displayed. The sample quilts illustrated give you an idea of how different your quilt will look simply by using a different setting of the quilt blocks.